Tucson, Ariz., May 27, 2015 – Calimmune Inc., a clinical-stage gene therapy company, has successfully completed its $15 million Series B financing round, led by a large pharmaceutical company. Alexandria Venture Investments also joined with existing investors including RA Capital Healthcare Fund LP and Translational Accelerator LLC. Proceeds will be used to progress the company’s ongoing HIV/AIDS clinical trials, advanced technology research programs and general corporate operations. Cal-1, the company’s lead therapeutic candidate, is a gene-based therapy engineered to control HIV infection and to protect individuals with HIV from progressing to AIDS. The therapy is currently being evaluated in Phase I/II studies. Cal-1 is designed to reduce production of CCR5, a protein on the surface of white blood cells that plays a critical role in enabling HIV to infect cells. It also has a second mechanism aimed at preventing viral fusion, the process by which the virus enters the cell. This dual approach was shown to be effective against broad strains of HIV in pre-clinical studies. In clinical trials for Cal-1, volunteers with HIV are infused with their own blood stem cells as well as mature T cells that have been treated with Cal-1. By reducing CCR5 expression and preventing HIV viral fusion, Cal-1 may protect the treated cells against HIV and has the potential to provide a continuous means of controlling HIV after a single treatment. The initial study sites are Quest Clinical Research in San Francisco and The UCLA CARE Center. “Calimmune has assembled a world-class team and a comprehensive technology arsenal that harnesses the power of gene therapy to combat HIV and potentially a wide range of challenging diseases,” said Peter Kolchinsky, Ph.D., managing partner at RA Capital. Louis Breton, Chief Executive Officer of Calimmune, presenting at the White Hat Life Science Investor Conference in Phoenix on September 18, 2014. According to the World Health Organization, some 35 million people are living with HIV/AIDS worldwide. In the United States, the number of people living with HIV/AIDS exceeds 1.2 million. Infection with the human immunodeficiency virus (HIV) can lead to acquired immunodeficiency syndrome (AIDS), a disease that severely impairs immune function and leaves the body vulnerable to numerous secondary infections and complications. 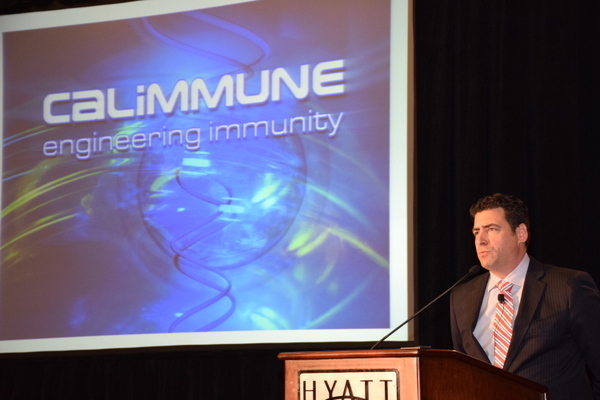 Calimmune Inc. is a clinical-stage biotechnology company focused on developing novel gene therapies that have the potential to improve and protect the lives of patients by enhancing their immune systems. The company was founded in 2006 from technology developed in the labs of Nobel Laureate David Baltimore, Ph.D. (California Institute of Technology), Irvin Chen, Ph.D. (University of California, Los Angeles) and Inder M. Verma, Ph.D. (Salk Institute for Biological Studies). Calimmune’s lead product candidate for HIV, now in Phase I/II studies, is being evaluated as a one-time treatment to prevent HIV progression to AIDS. Calimmune is developing a full product pipeline of therapeutic candidates to address the unique needs of individuals at different stages of HIV infection and with various treatment histories. The company is headquartered in Tucson, Arizona with labs and branch offices in Pasadena, California and Sydney, Australia.